Danish artist Armsrock, is one of a handful of artists on the Urban/Street art scene whose work reaches out beyond the confines of the genre. The quality and unique nature of his work, both on the street and for the gallery, has made him stand out in that talented crowd. For those of you not familar with Armsrock's work, it consists of delicately drawn figures, which he then pastes on walls in urban settings. Mostly life-size portraits of humans on the edge of society, the character and placement of these pieces make them feel, sometimes, as if they have been tattooed to the wall. At other times, they can appear transitory - as if they had just arrived at a scene and are about to move on. 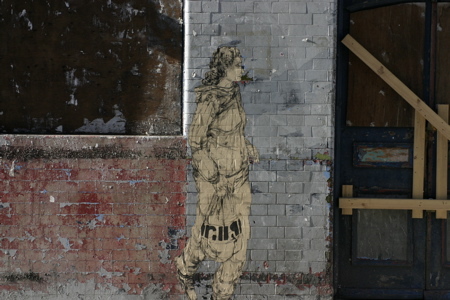 Below is one of his street pieces we pictured on his last visit to London back in 2007. More recently, he has developed an analogue projection technique that enables him to combine his magical drawn figures with light. This has the effect of making the images even more fragile and fleeting, almost like ghosts. 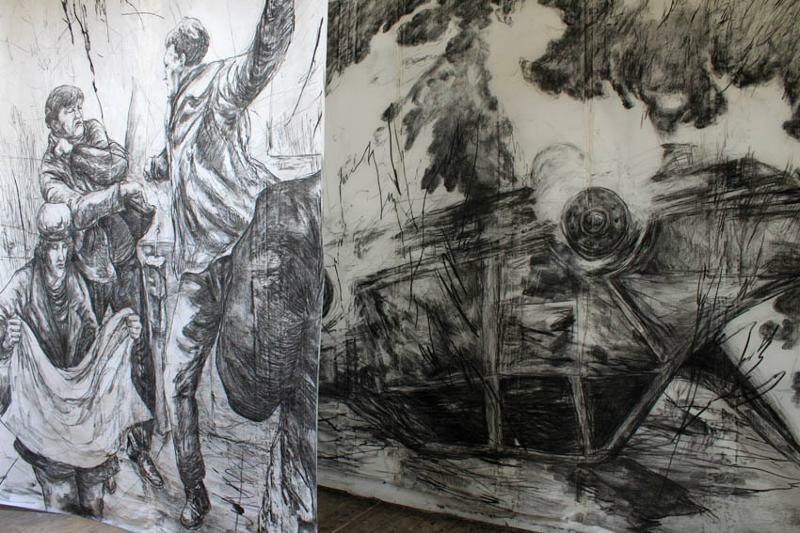 His new show in Signal Gallery is called 'Drawn Towards The Present'. The show will be built around an installation that will consist of monumental charcoal drawings on rice paper. The imagery represented in the drawings is based on press-clippings from the artist's archive, which have been reworked to create a fragmentary representation of contemporary history and a glimpse into our future hopes and fears. Private View: Thursday 3 June. The show is then open until the 19 June 2010.